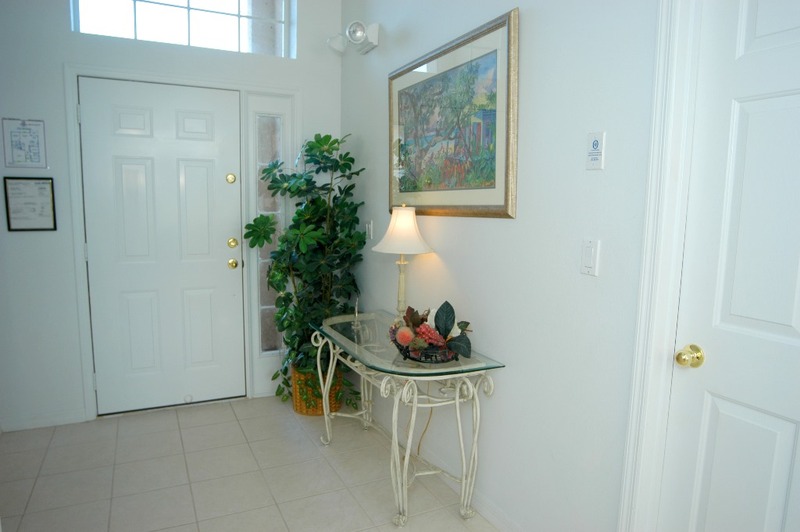 3 bedroom, 2 bathroom villa in the Eagle Pointe community. Owned by Maria and Graham Kemp. Ref: 1176. WILDLIFE observe the birds & mammals. ** High demand for 2019 and 2020, book early ! ** TV in all bedrooms. This Private Villa has the lot! ,PRIVACY, LOCATION,POSITION AND LUXURY. * Private pool glorious views over water. * Close to the 192 with its wide selection of shops, restaurants and attractions. * Central for the other Parks, beaches, restaurants and .... shopping. * Large Dual King bed in Master. 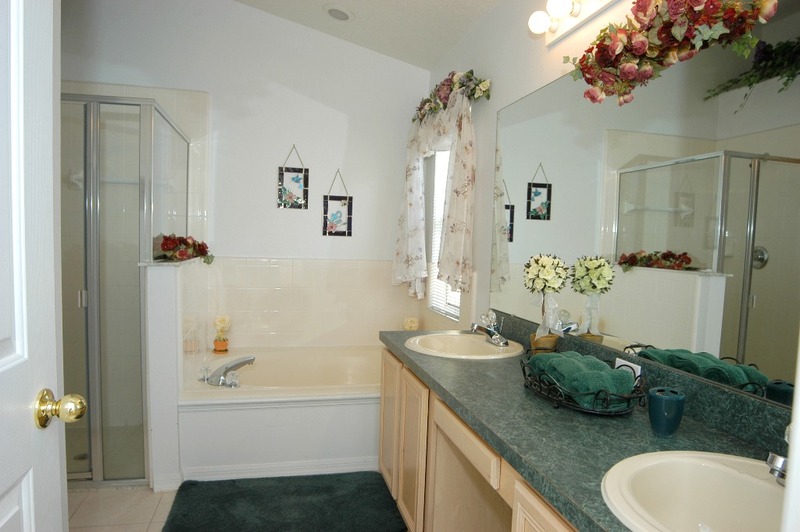 * Large en suite with separate bath tub and walk in shower. 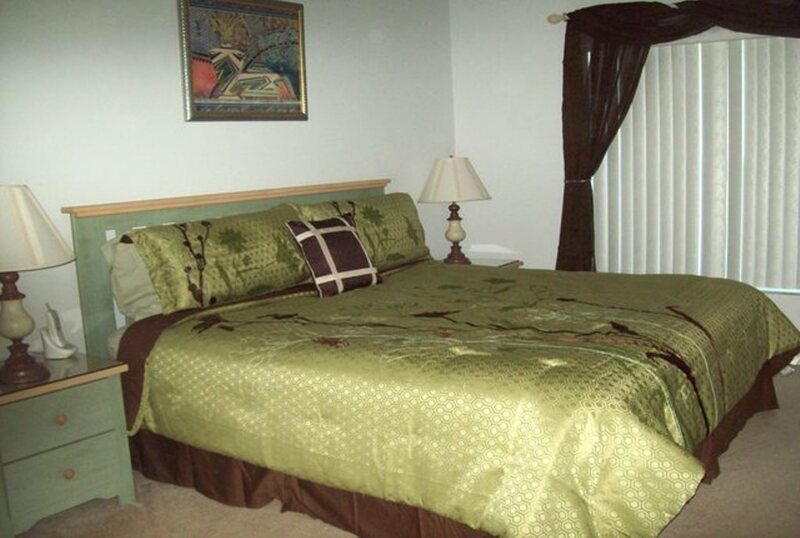 * Large Queen bed in Second bed room. * Hairdryers in all bathrooms. 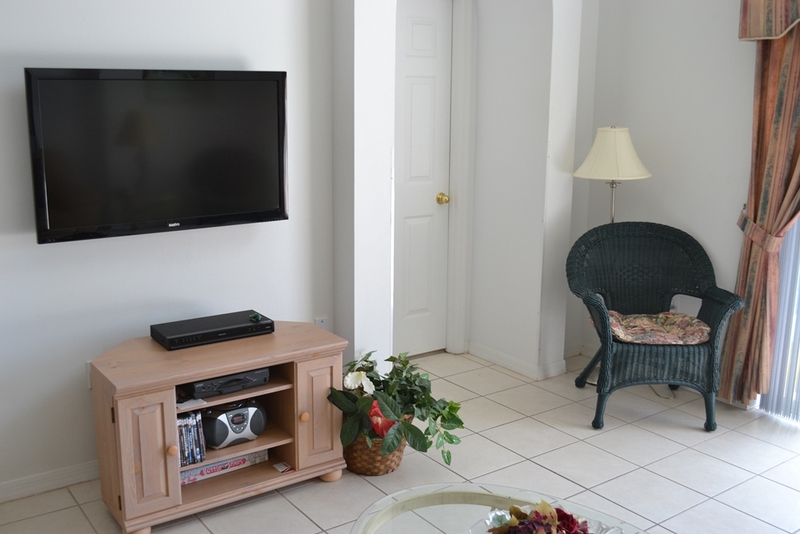 * Large Cable TVs in all Bedrooms. 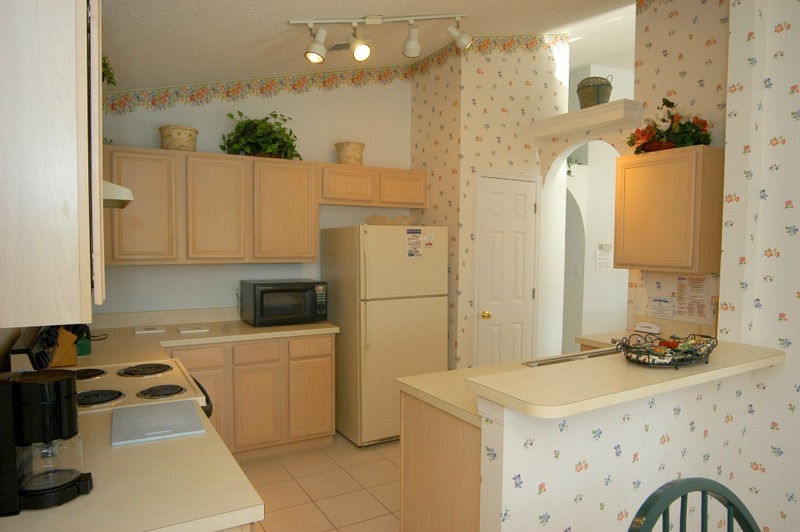 * Large Laundry room fully equipped,washer,dryer. 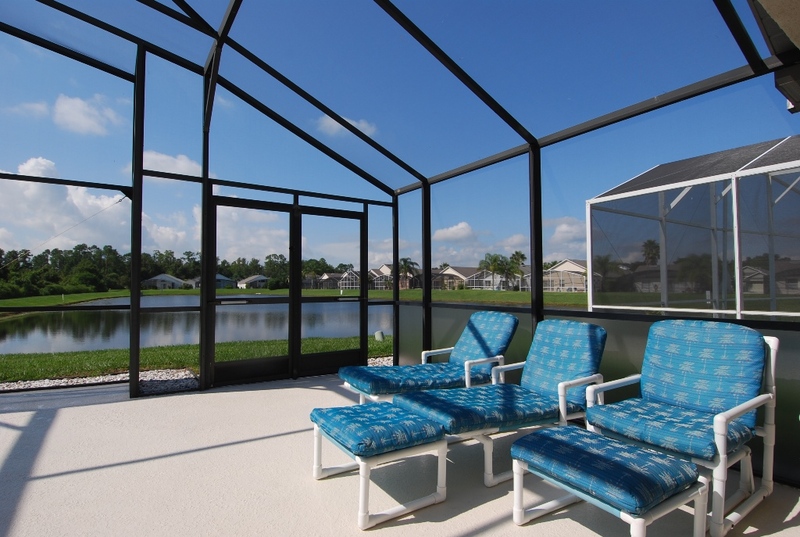 * Large extended lanai with comfortable loungers/chairs. 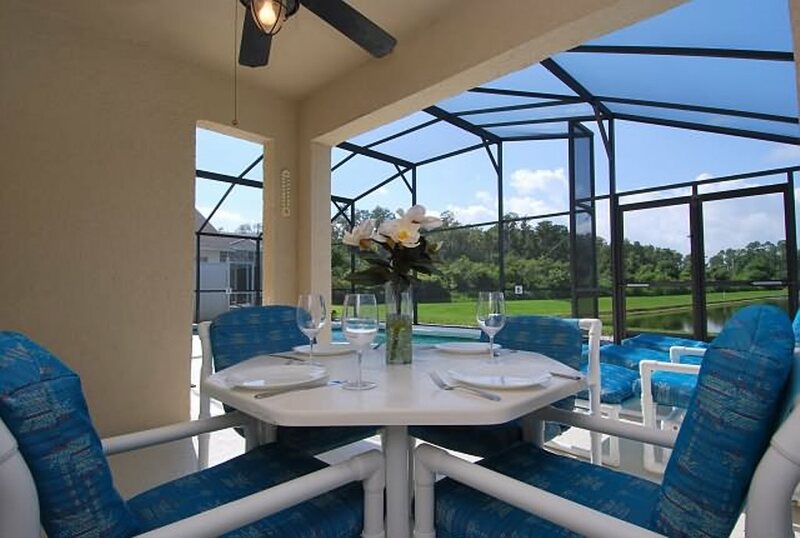 * Shaded Lanai area with fan and light for AL-fresco dining. * You will not want to leave this villa!, set in a prime much sought after location, on the edge of a beautiful private lake with fish,turtles,birds and other wildlife. * Fishing in Lake Fish in the peaceful lake at the bottom of your garden. * The Villa also benefits from views onto a large CONSERVATION AREA and LAKE, ensuring total privacy and tranquility. * FREE crib, high chair, stroller if required. * FREE Wireless Broadband Internet access. Sit by the pool with your laptop ! * FREE All utilities included. The home has three large bedrooms. Two double bedrooms and a twin bedroom. It also has two luxurious bathrooms. 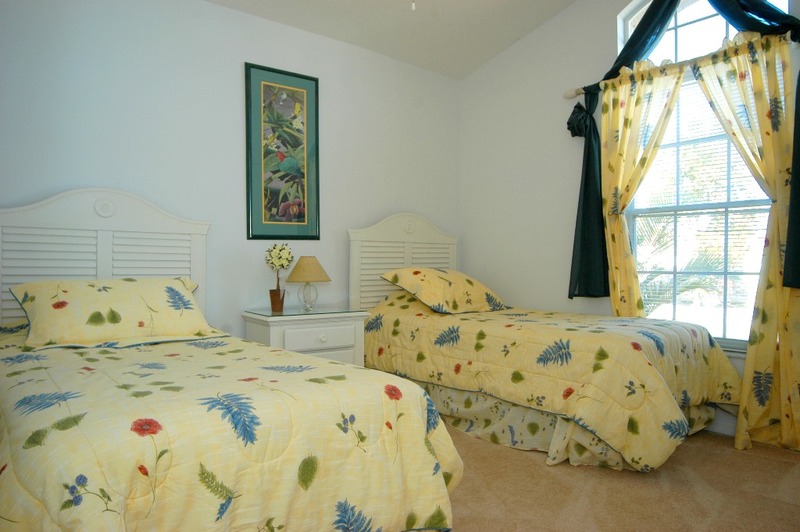 Our home can comfortably sleep up to 6 Guests plus a baby. The kitchen is well equipped with cooker/oven, microwave, American fridge/freezer, dishwasher, toaster, coffee machine, together with all your plates, cutlery,linens, etc. 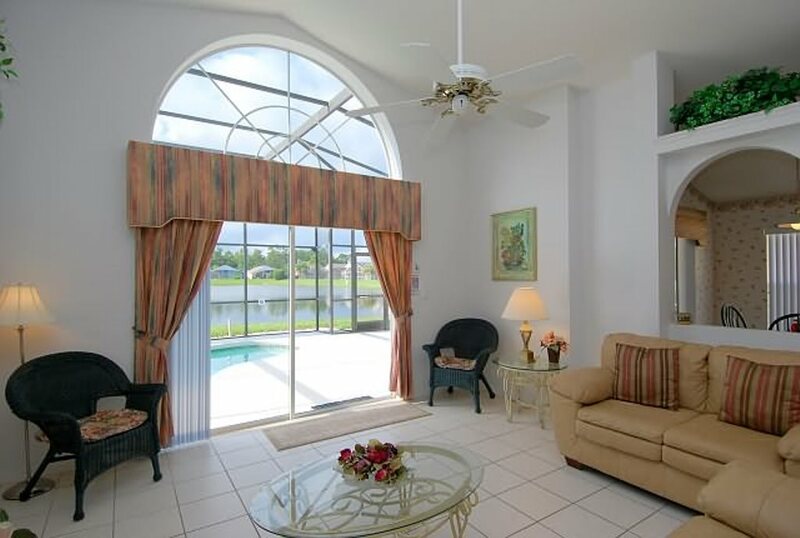 Situated off the kitchen is a "nook", or second dining area where you can sit and look over the pool and lake. This nook opens out onto the pool area via glazed doors. It has a large hallway with separate laundry room off.The laundry has a large washer, large dryer, iron, etc.Through the laundry access is gained internally to the double garage. The hallway opens up into the living room and separate dining area. The living room is well furnished, comfortably seats up to 7 adults, with leather settee seating three,leather love seat, seating two, plus two separate chairs. It has a large wall mounted HDMI TV,HDMI DVD, and ceiling fan/light. This light luxurious living room has a feature semi circular window giving fantastic bright views over the Lake and conservation. The living room opens out via glazed doors onto the pool area and gives Southern views over the Lake and Conservation area. The sunsets are stupendous from this home. A beautiful room with a beautiful view. The formal dining area is adjacent to the living room and offers formal dining seating for upto 6 adults. You can view the pool and lake from this dining area. 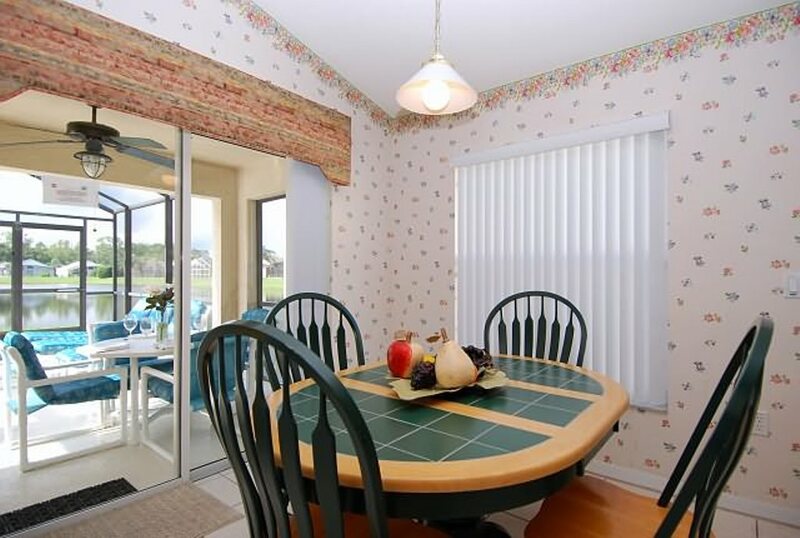 There is also a less formal dining area (nook) off the kitchen, this leads onto the shaded Lanai. The rear Master bedroom has the largest Dual King sized bed, walk in wardrobe, with Safe, ceiling fan/light,large wall mounted TV , clock radio, dressing table and bedside cabinets and lamps. There is a large en suite, with facilities including separate his/hers wash basins, separate bath tub, separate large shower cubicle,hair dryer, and a separate roomed w.c accessed from the en suite. This bedroom looks South over the pool/lake affording both privacy and astounding views along the full length of the lake. 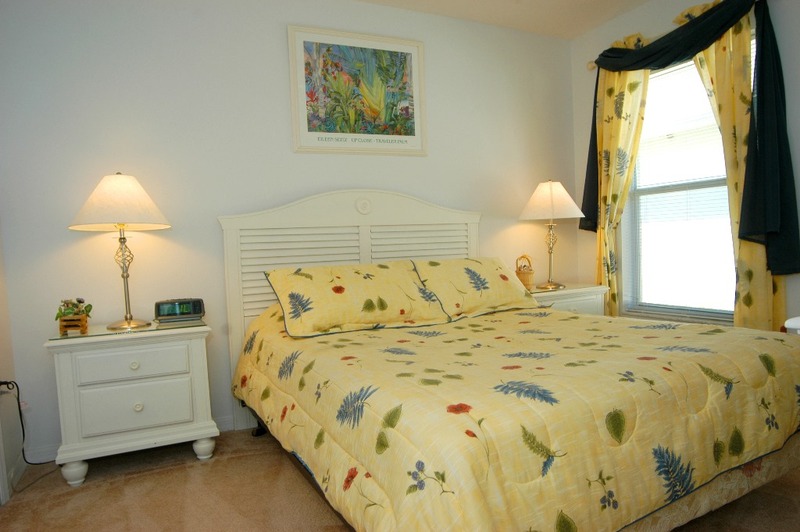 The second double bedroom has a large Queen sized bed,large wardrobe, ceiling fan/light,large wall mounted TV ,clock radio, bedside cabinets and lamps, and is adjacent to the second bathroom, which is complimented with matching colours and textures. The third bedroom has two single beds,large wardrobes,ceiling fan/light,large wall mounted TV,clock radio,and bedside cabinet and lamp. This bedroom has access to the second bathroom. The second luxurious bathroom has washbasin, separate bath/shower and w.c.This bathroom serves the Double and Twin bedrooms. The home has a Key pad Electronic Safe, free for your use,New cot,playpen and high chair if required. WIRELESS internet access extends throughout the inside and outside of the home. You are not restricted re internet to your location. You can sit outside and check out the places you want to visit! 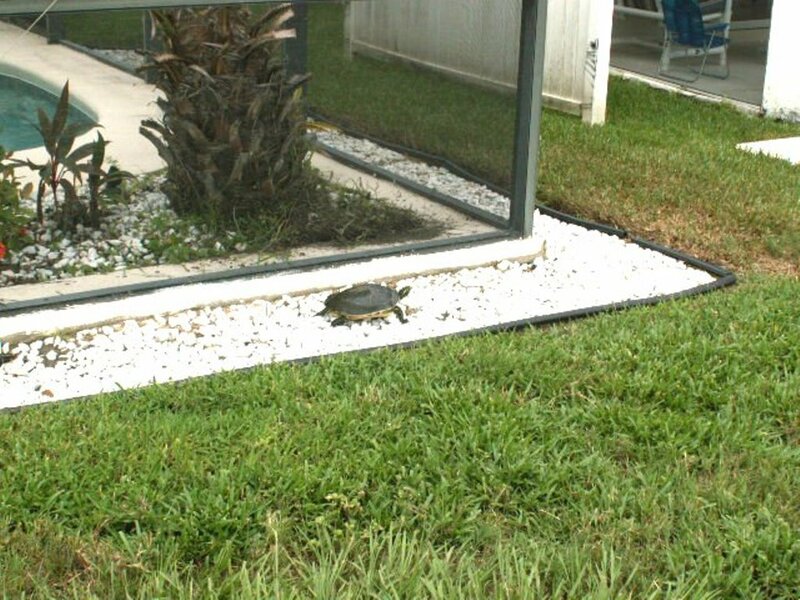 There is also double garage which enables your car to be kept cool in the Florida heat. 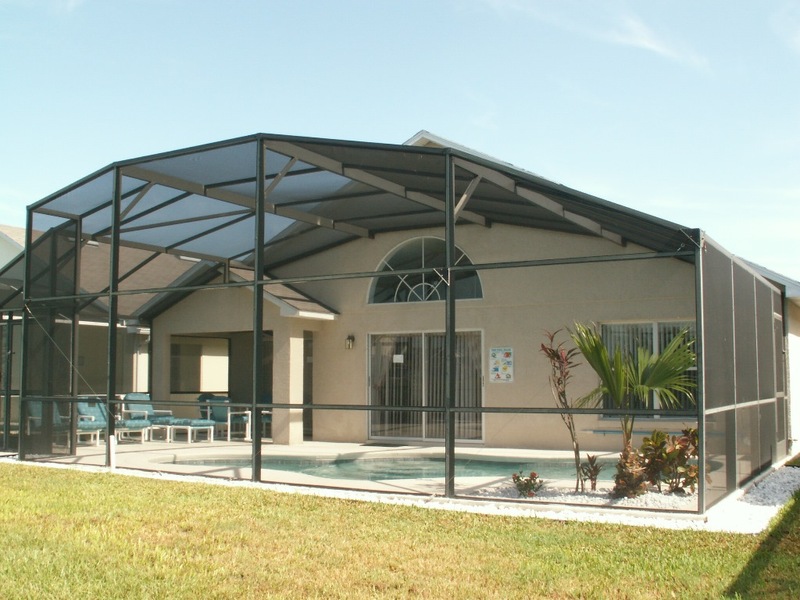 Outside is a beautiful covered large 24 X 15 swimming pool facing South onto the Lake and Conservation. 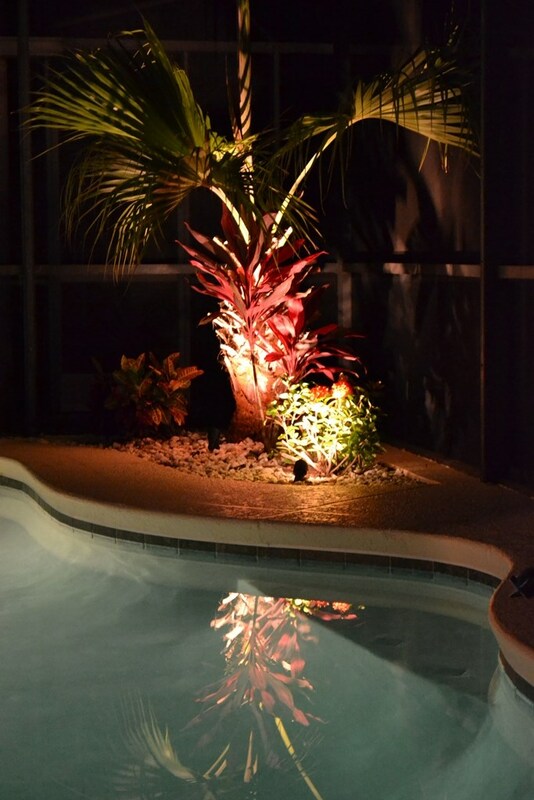 This ensures all day sun in a totally covered pool to protect you from any insects, but still enabling a golden tan.Within the lanai is a beautifully floodlight landscaped area. BBQ can be made available. A real Tropical paradise ! 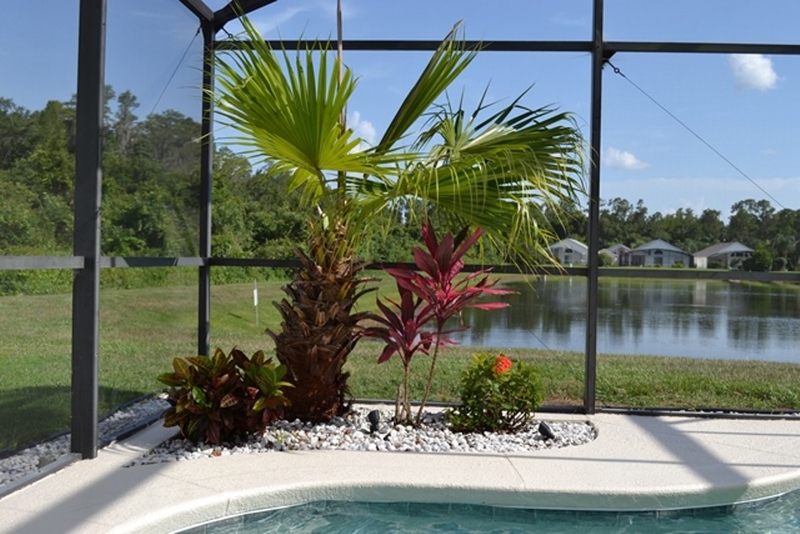 Due to the size of the lake you are ensured privacy to swim and sunbathe at your leisure. 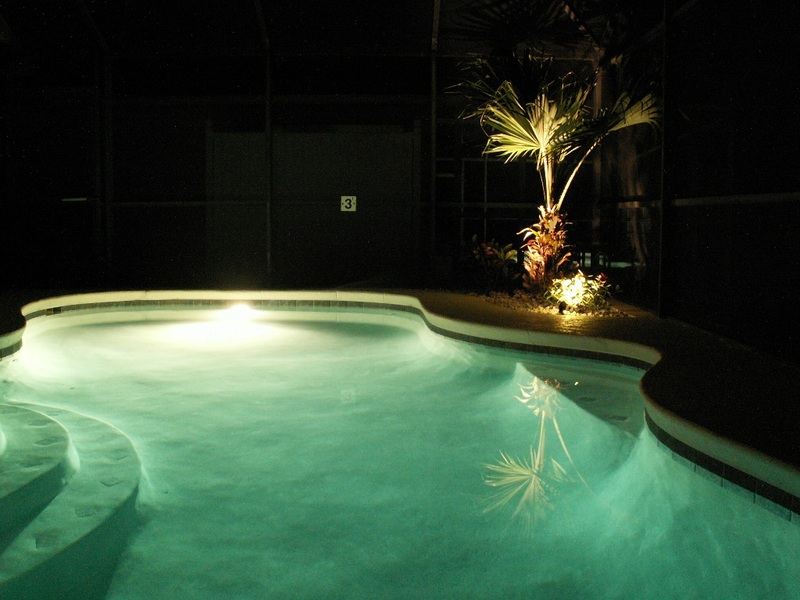 The pool also has lights for those cooling evening swims after the "parks". The pool can be heated in the cooler months (recommended Oct to Feb see rates/prices). However due to the South facing aspect, the pools stays warm throughout the other months. The pool has a pool blanket and roller to assist in maintaining the pool temperature during the cooler months of October to February. 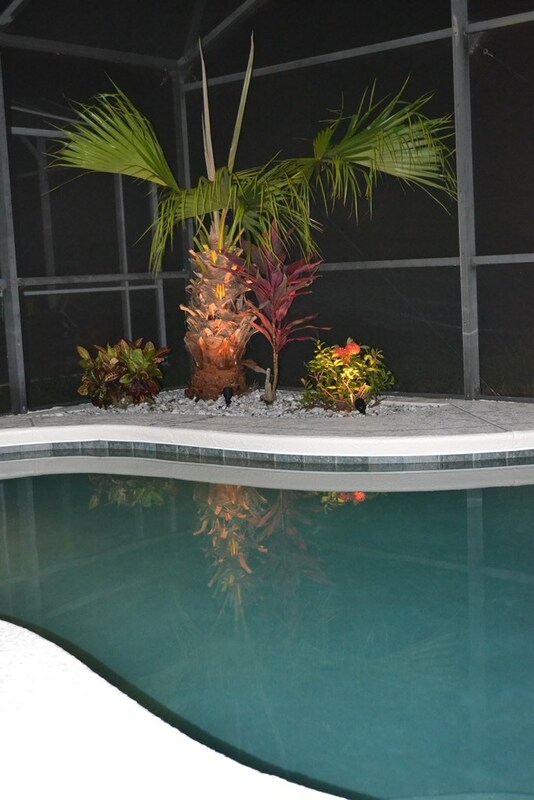 There is a shaded area leading from the kitchen nook to the pool, which has table/chairs, also a ceiling fan and light for those evening drinks by the pool.You can have a respite from the Sun if preferred, or you can sit with your laptop and plan tomorrow! We have a personal,professional management company, who are on hand to assist you with any query or service. Their number is contained in our information folder within the home, and they can be contacted, and will assist you at a moments notice. Altogether, this home has everything and more that you could want in your luxury, executive, dream Florida home. NO GIMMICKS.. JUST A BEAUTIFUL SOUTH FACING VILLA IN A BEAUTIFUL SETTING OVERLOOKING A TRANQUIL LAKE AND CONSERVATION! To stay in our beautiful home. Please see our rates. You will be staying in a prestigious and Superb positioned South facing Lakeside home. In the best location! NOTE. All rates are inclusive of full clean and preparation prior/after stay. * Prices are for exclusive use of our Villa NOT per person. * Stays of less than 7 nights incur a villa cleaning fee of £57 / $90. * Deposit of £200.00 / $350.00 per week booked, required to secure dates. * Balance of rental due 8 weeks prior to Travel. Please don’t ask for discounted rates this home would be offended!! We will quote you a total rate, no hidden extras! Minimum rental period ..... We don’t have one! Arrival day .....Your vacation can start and end on any day, so that you can take advantage of less expensive and less crowded mid week travel. We were there for the hurricane and Grahams communications with us were brilliant, we were due to leave on the Sunday but couldn't because of this and Graham let us stay in the villa until Tuesday morning, which was amazing as our other villa was inaccessible due to the hurricane, would definitely stay here again. Owner's response: Thank you Richard for your review. Unfortunately we cannot control the weather but I am glad you enjoyed your stay and was happy to support you and your family. We have had another fabulous time.The pool has been fantastic ! Two more days of paradise. Owner's response: Thanks again for your feedback. I look forward to your next stay once you finalise your dates. Owner's response: Thank you for your feedback.We hope to see you again soon. Owner's response: Thank you again for your feedback. You are welcome anytime. We were in USA for granddaughters graduation at Penn State University where son is a professor. Your villa looked lovely on website and was just the right size, had a pool and overlooked the lake - suited us perfectly. The Lake provided us with a nice view and many interesting birds as well as some privacy.We were already fond of Celebration and Winter Park, so we enjoyed revisiting, while the Disney World attractions were close by for son and granddaughters to revisit. 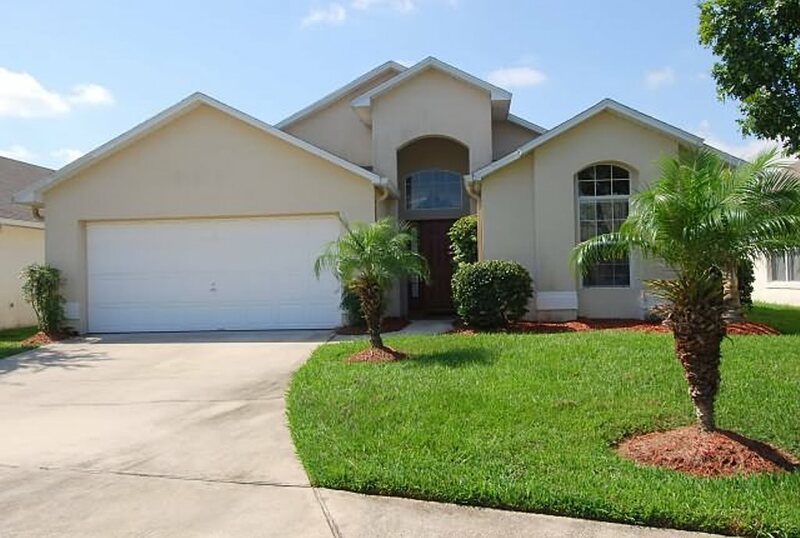 We were very pleased with and felt at home in your villa, and though Florida and Disney World is not what we would be seeking again soon for a holiday, we would be happy to return to your villa in Eagle Pointe and have already recommended it to family and friends. Best wishes and thanks for all the very helpful information you shared with us in preparation for our trip. Owner's response: Thank you for your feedback. I note you have booked for February, will will ensure you have a great time again. Our second visit ! Fantastic !! Really getting to know the area, We'll be back! We love the lay back days at the pool. Enjoyed the heating, Great weather tho! Owner's response: Thankyou for your feedback. I know you have already booked to stay again. We had a lovely holiday in this super villa.The location is fantastic and we have loved the wildlife - the folder is brilliant idea! Owner's response: Thank you for your review, yes we find the folder is very useful to identify all the wildlife that visit the lake and conservation. Owner's response: Thank you for your feedback, it is most welcome. Hope to see you again. first visit to this villa, been in 2 others on this lake but this is by far the best ! Weather 90 +F everyday- wonderful holiday thanks Graham and Maria. The villa is perfectly located for both Disney, Universal and shopping but is secluded enough if you just want to get away from it all. Walmart is just a couple of minutes drive away, and the Disney gates really are only 12 mins away. The villa came equipped with everything we could wish for, washer dryer, dishwasher, dvd player, cd player, kettle, wi fi etc . 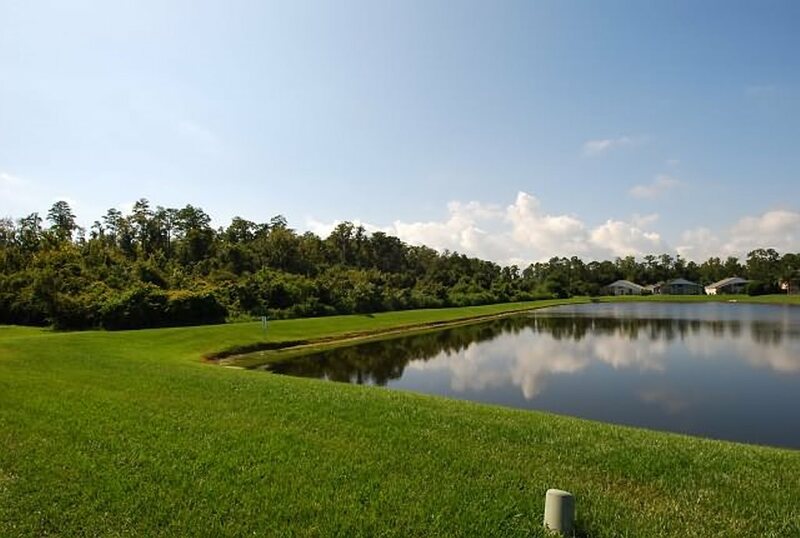 The view and setting by the lake is amazing we spent most evenings fishing, watching the wildlife (gator,herons,birds of prey,snappers to name just a few).As seasoned visitors to Orlando we wouldn't hesitate to recommend this villa"
Your enquiry will be sent to villa ref 1176 only. This page has been viewed 134835 times since 15 Dec 2003.